RAW Cane Molasses is a highly concentrated, water Soluble micronized molasses that gives all the benefits of Liquid Molasses without all the mess. The smallest 2oz package of RAW Cane Molasses is equivalent to 1 gallon of liquid molasses which makes it easier to transport. Cane Molasses is an excellent source of carbon energy (food) for beneficial microbes. RAW Cane Molasses is a beneficial supplement to all feeding schedules. Works in conjunction with all nutrient and feeding programs. RAW Yucca is made from 100% natural yucca extract from the plant Yucca Schidigera. It can be used as wetting agent for nutrient solutions and foliar sprays and is great for flushing excess salts from the root Zone. When used on soils, it helps water and nutrients penetrate deeper and more evenly into the root zone. We recommend adding a pinch (1/16 tsp per 5 gallons) RAW Yucca to all foliar, nutrient and flush solutions.Works in conjunction with all nutrient and feeding programs. RAW Phosphorus contains 61% pure water Soluble Phosphate (P). This product also contains a small amount of Ammonium Nitrogen (9%) which plants can utilize during bloom. Phosphorus is particularly beneficial during the early rooting stage but also provides energy during fruit and flower production. 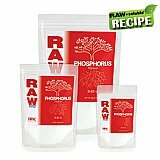 RAW Phosphorus is ideal for boosting Phosphorus (P) levels, treating deficiencies and creating optimal recipe solutions. Works in conjunction with all nutrient and feeding programs. RAW B-Vitamin contains 1% vitamin B1 which is the highest concentration of water Soluble vitamin B1 available to the home gardener. RAW B-vitamin also contains 9% magnesium and is an optimal magnesium supplement. RAW B-Vitamin is most beneficial during transplant, times of stress and during heavy fruit and flower production. Raw B-Vitamin can be used at all times of growth and bloom and is a beneficial supplement to all feeding schedules. Works in conjunction with all nutrient and feeding programs. RAW Calcium/Mag contains 15% calcium and 3% magnesium. 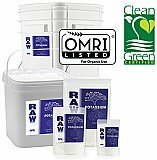 RAW Calcium/Mag has optimized the ratio of each element in a Water soluble formulation of calcium nitrate and magnesium sulfate so that it doesn’t leave the media salty. This product is a stand alone Calcium / Mag supplement. Due to its low dilution rates a little RAW Calcium / Mag goes a long ways. Its also ideal for preventing deficiencies, treating deficiencies and for creating optimal recipe solutions. Works in conjunction with all nutrient and feeding programs. 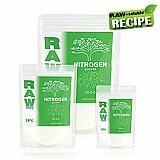 Use RAW Full Up in conjunction with all nutrients and supplements. It is a beneficial supplement to all feeding schedules. Its also ideal for adding to foliar sprays and for creating optimal recipe solutions. Works in conjunction with all nutrient and feeding programs. 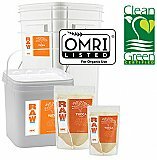 RAW ominA (essential) is a naturally available source of 14% vegan Nitrogen derived from plant protein hydrolysate. 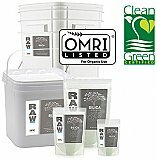 ominA is easily absorbed producing a dramatic effect on calcium uptake by the roots! It is completely water Soluble and will not clog pumps or irrigation lines. Use RAW ominA in conjunction with nutrients and supplements throughout all stages of growth and bloom. It is a beneficial supplement to all feeding schedules. Works in conjunction with all nutrient and feeding programs.